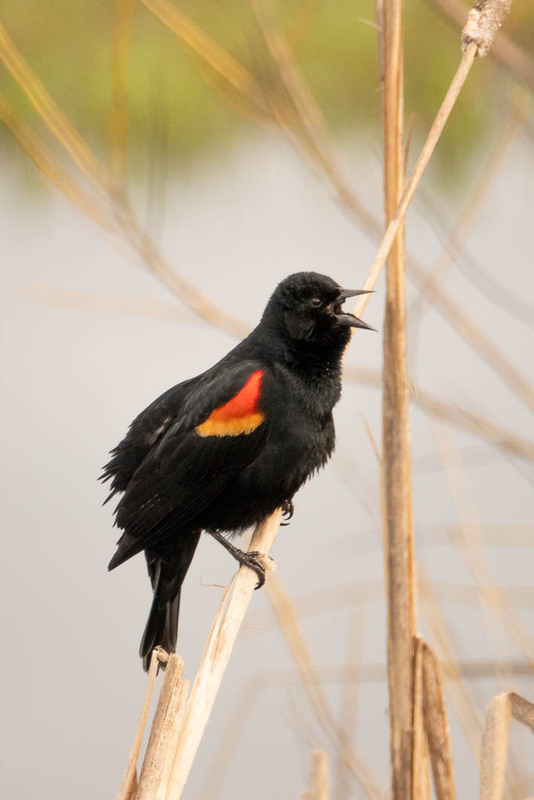 Red-wing Blackbirds are so common in the wildlife refuges. I usually don’t pay much attention to them. But when they are there in flocks and flying around. I felt I need to do something about it and this something can not be a ‘Just a blackbird’ shot. 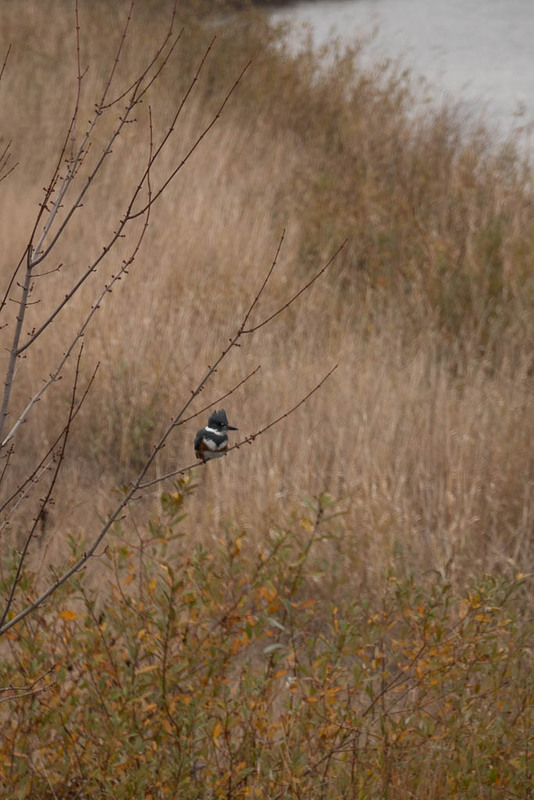 First and an easy one, press the shutter when the bird sings. Even better, when the bird flapped its red wings. It looks like a King-Kong in this pose. And, it took off in that split second and I captured it ! Can be better if it was not cloudy, but hey, this is my first. Wet and cold winter linger. Except a few early blooms, colors are sporadic and barely visible. Bird activities seems to usually start in February and that’s where my camera goes. 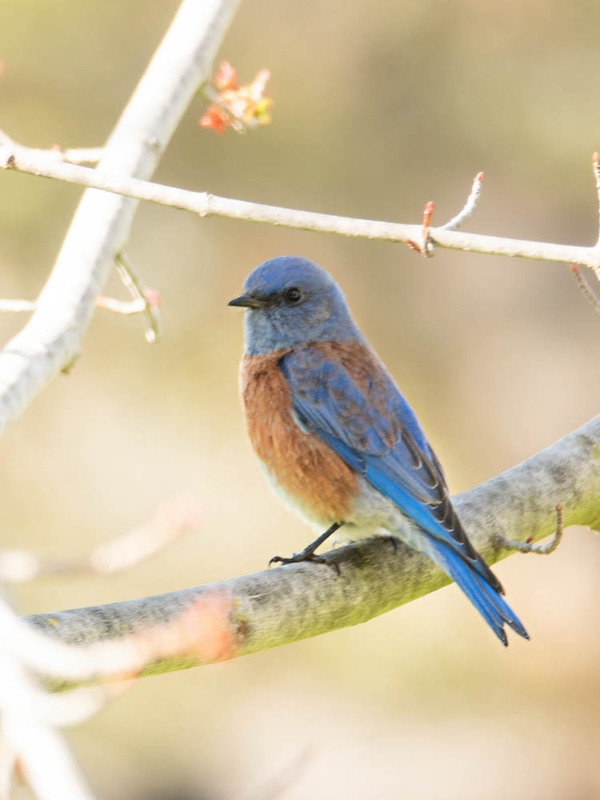 In my continuous pursuit of Western bluebirds, I found them in more places. They are around, but if not for the luck, they are usually too distant to reach. I desired a clear shot with their gorgeous feather fully shown, but whenever that opportunity popped up, they were in the shade. It seems to me that their natural instinct teaches them the risk of fatal attraction. 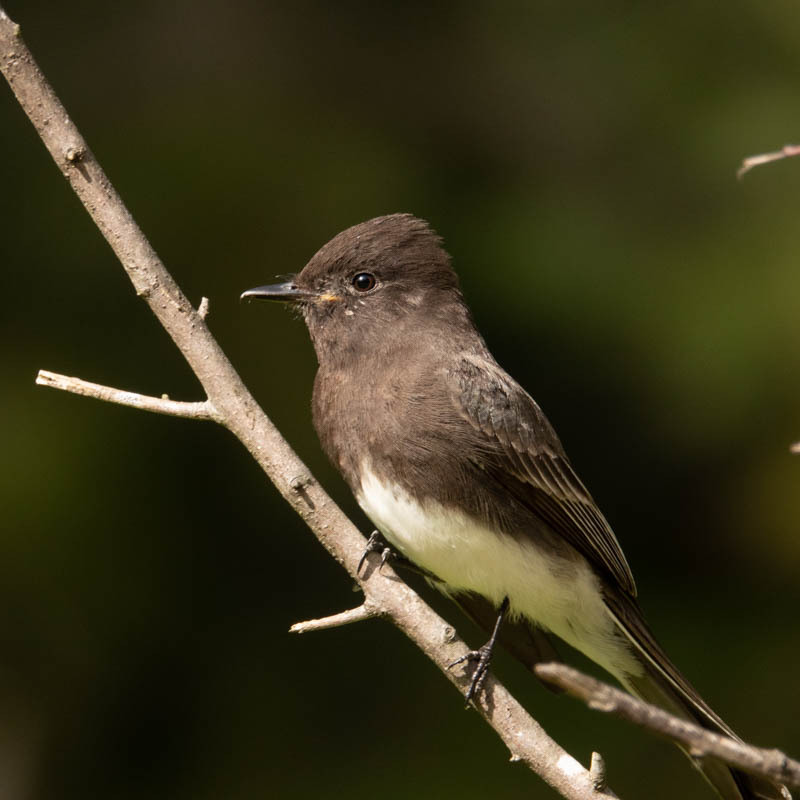 Black Phobes are common here. They don’t have dramatic outlook and thus can enjoy their freedom everywhere. We all want to be unique and outstanding, but being ordinary is not necessarily a bad thing. 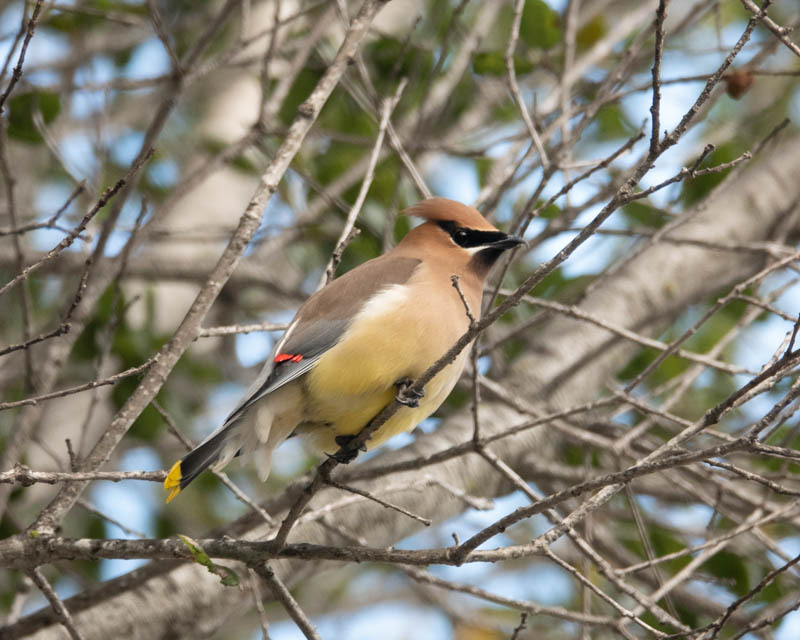 Cedar Waxwing is one of my all-time favorites. I have enough of their pictures, but I can never get tired of taking more. 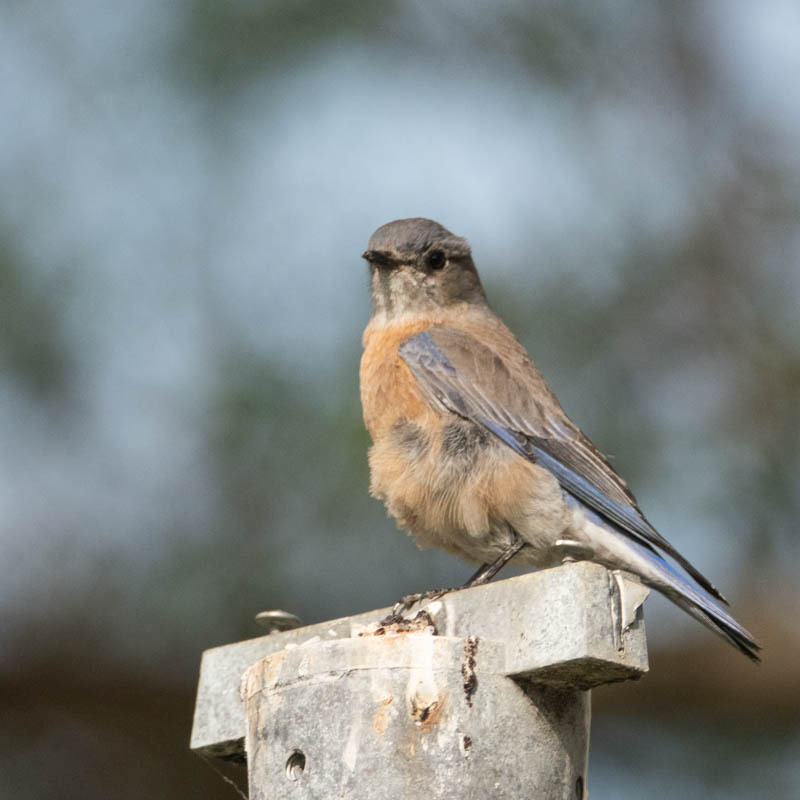 I thought this is a new bird, but they are juvenile Western Bluebird. 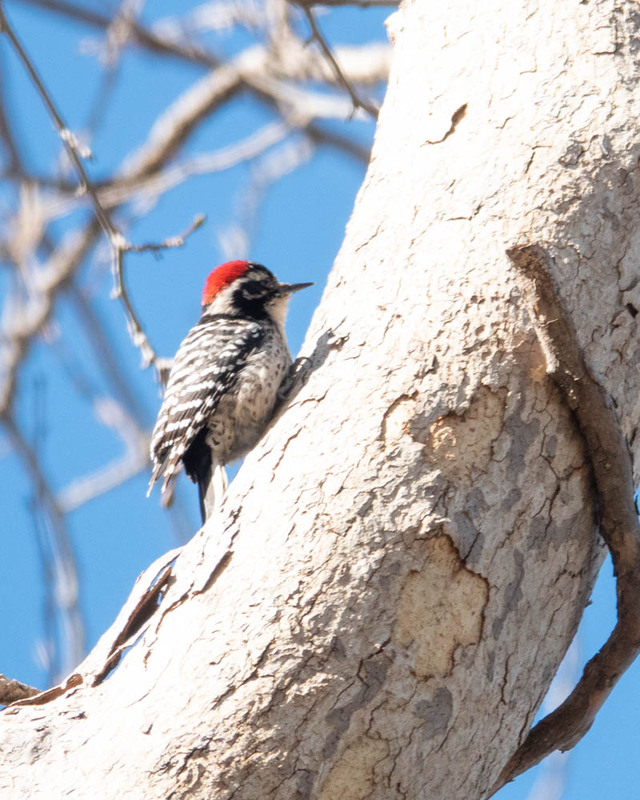 They wear red caps like Acorn Woodpecker, but Nuttall’s Woodpeaker has striped outfit. 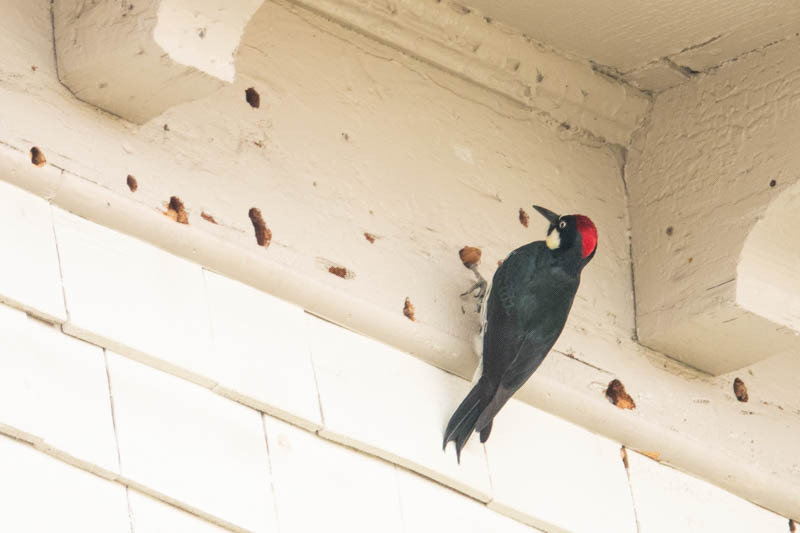 Thriving trees and shrubs are in the vicinity, but Acorn Woodpecker is doing his woodwork on somebody’s house. If your house is aged, be aware. Enough of birds, I am longing for spring colors, or, more new birds. Nature provides me inspiration. Sunshine brings me energy. Nature was my comfort zone and now I am chasing sunshine. Not only me, birdies are more active when they have more choices of berries and seeds. 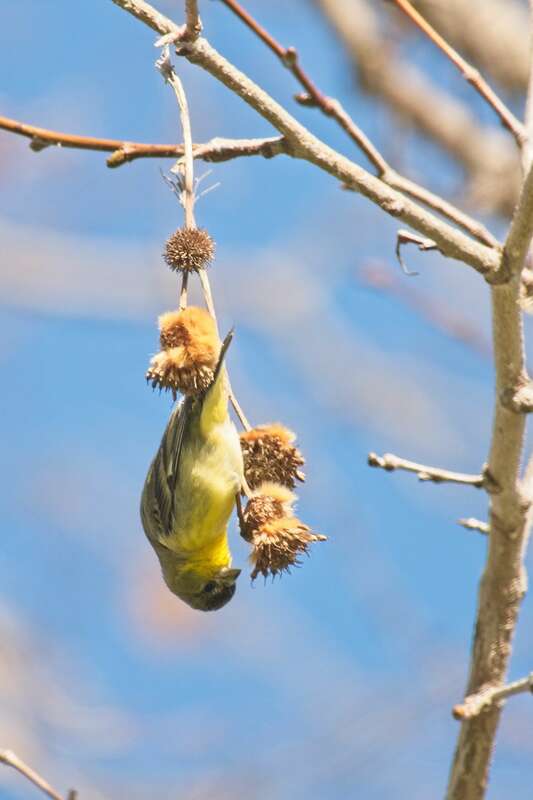 At least I have not seen a gold finch hanging himself upside down till now. 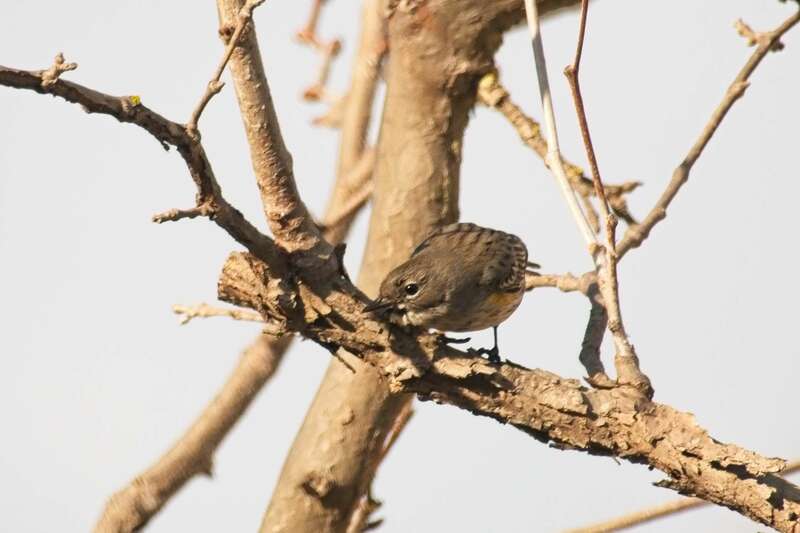 So hard to capture a warbler. 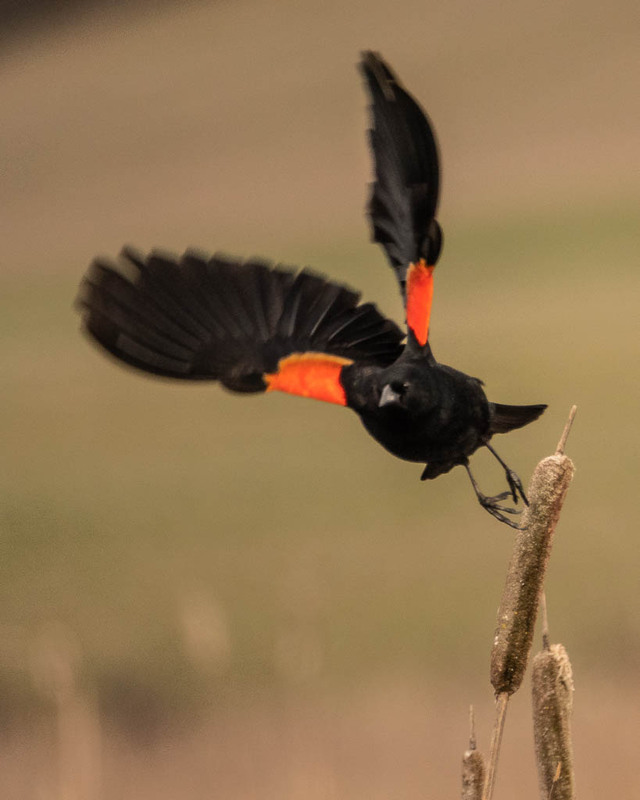 They are so fast-paced that chance to have a clear shot depends purely on luck. When the light is good, success rate increases. I have not photographed them from this angel. 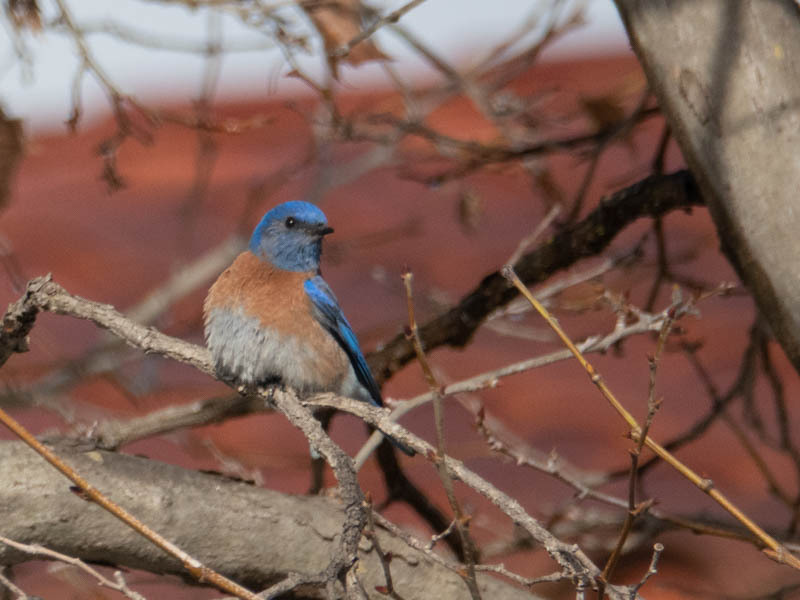 Completely unexpected, I ran into a small flock of bluebirds. I may have seen one from distance in the past. This first closer encounter has made my day. Though he hid himself in the shade, I am content with what I got. You know I will continue to pursue that perfect shot particularly such a gorgeous creature. 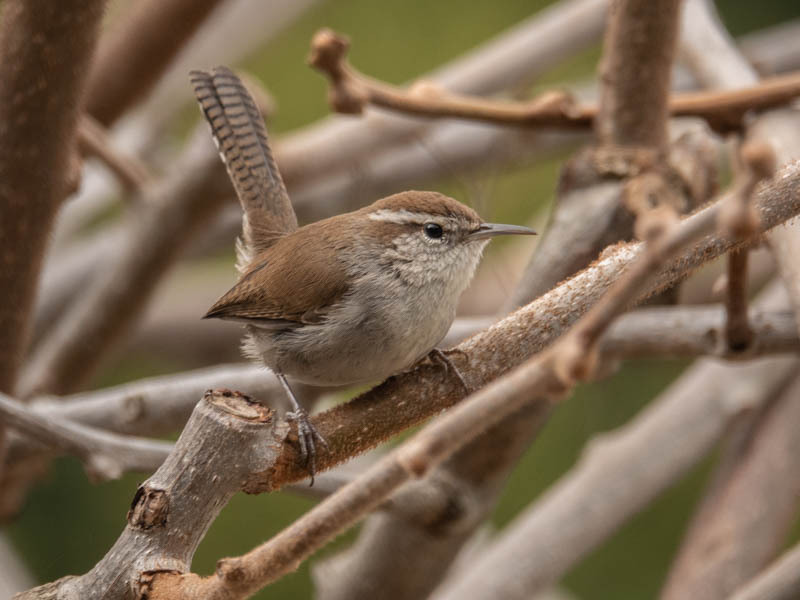 Bewick’s Wren is not uncommon, but a clear shot in the right angle does not come easy. Two favorite birds in a shoot, I call it a good day. Passing through northern California, I was attracted to the sea of Snow Geese. They are the resemblance of Canadian Geese in our area. It’s so fun to watch their large community gathering on the field, taking off, and marching in the air. 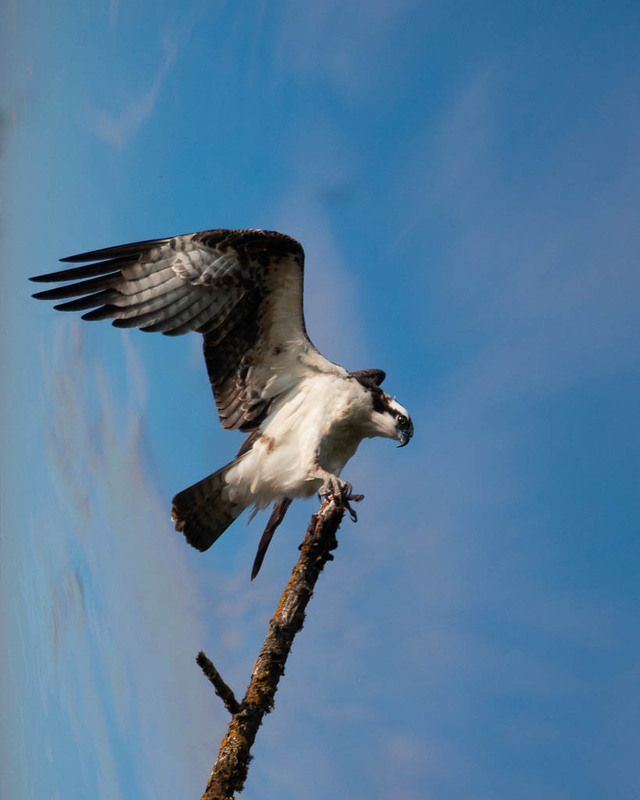 Birds have no place to ‘go home’, but their habitat is much beautiful and peaceful than ours. 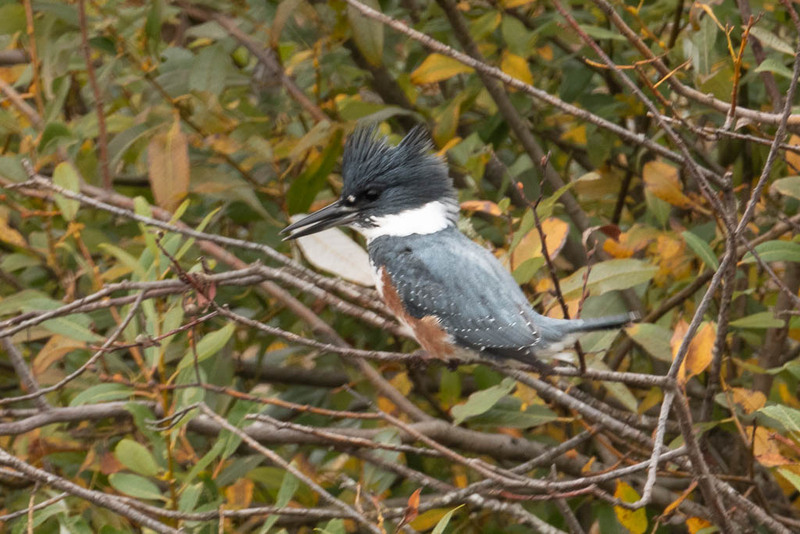 As a single, they might not look as distinctive as other exotic birds. As a whole, their uniform movement is quite interesting. This is not the first time I intended to communicate with the birds. I could not get a good shot of the hawks until recently. 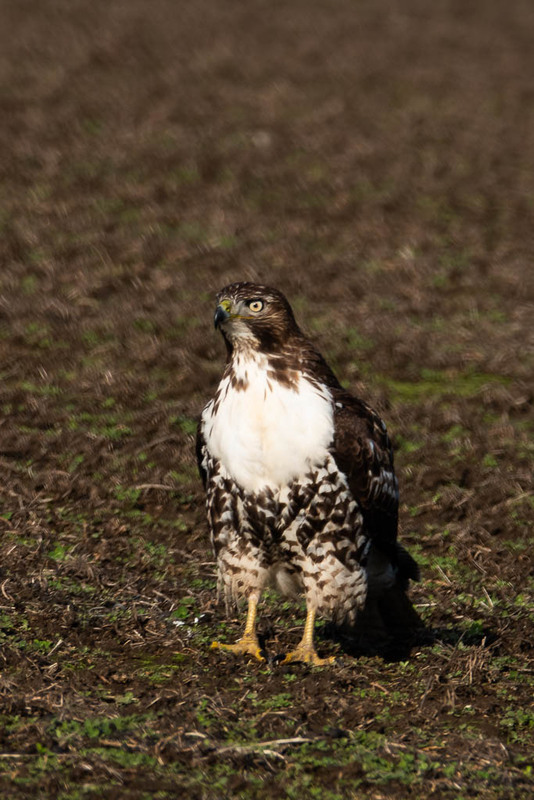 When this Red-tailed Hawk turned his head to acknowledge my greetings, I was thrilled. First I saw the Hawk was harassing the Crow. Without having them exposed by the camera, I would never notice that it’s now the Hawk was running for life. In our real life, we have our turn to be Up and Down. Don’t lose heart. Keep up and stick to the goal. 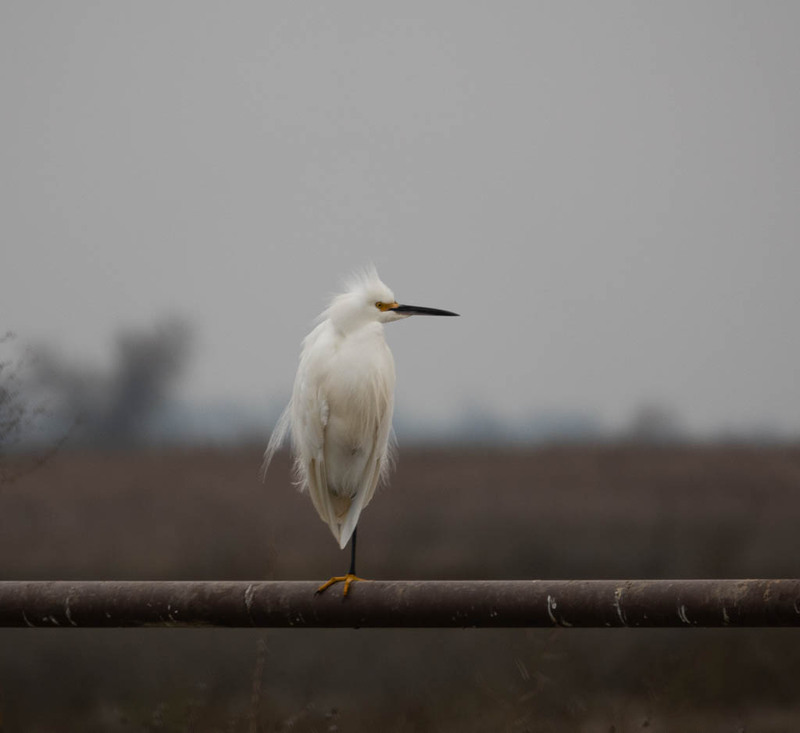 Egret has that beautiful white feather. It looks, even more, appealing when it’s all fluffy in the cold weather. 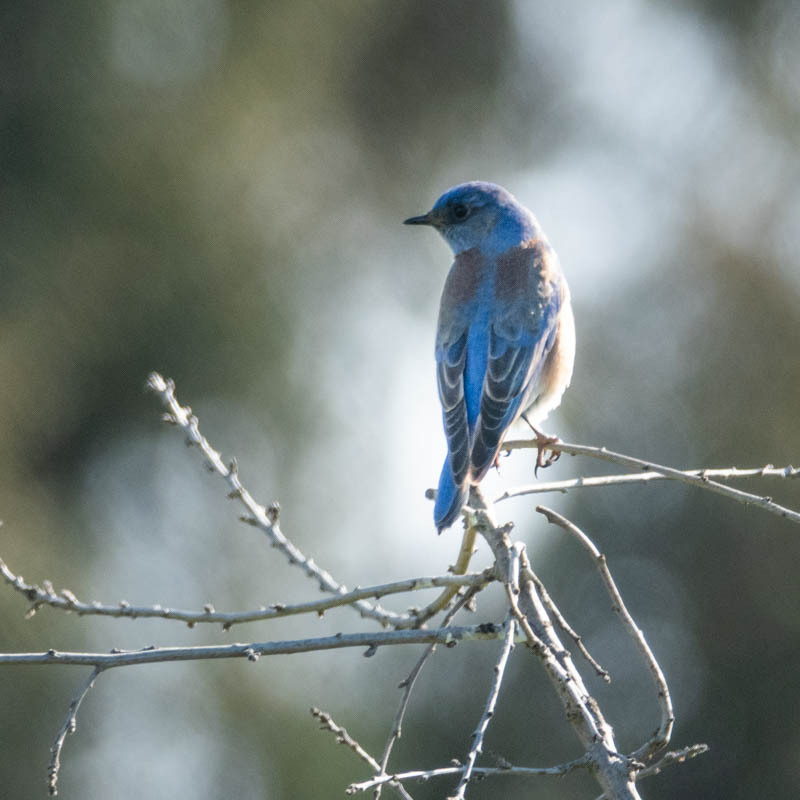 Birds instinctively know how to keep themselves warm. I, however, cannot figure out why he stood there on one foot. Maybe his foot was hidden inside the feather for heat. 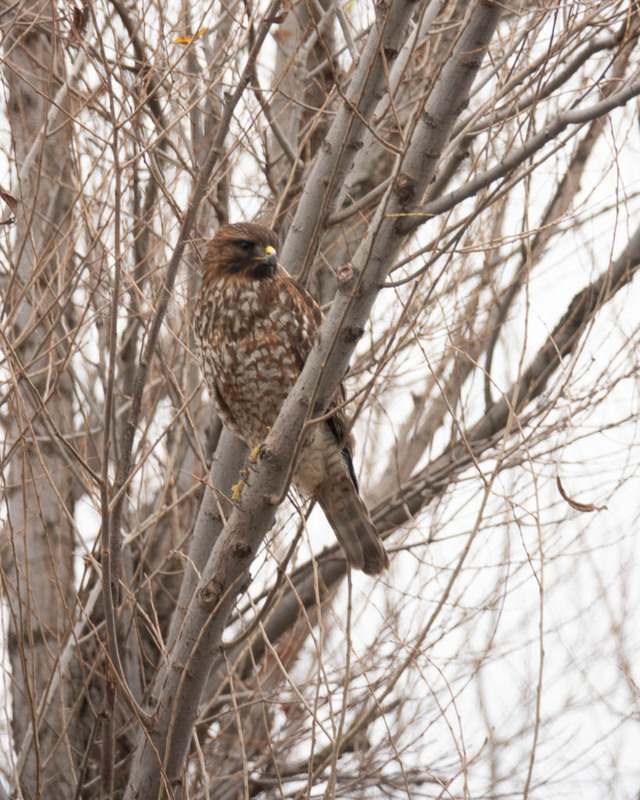 Ever since I began to get some hawk shots, there are more seen and captured. I have to say this is my theory of ‘secret of desire’. When you desire hard and long, things will become to unfold for you. Ibis has a unique curved beak and long legs. 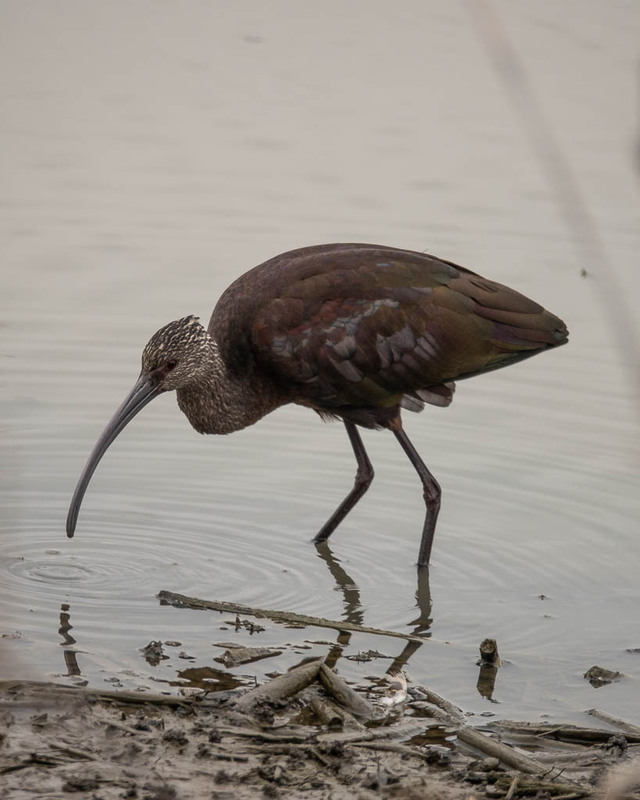 I have seen Egyptian Ibis in Asia and White Ibis in Central American, but this Glossy Ibis is new to me. It was a shortstop and a brief bird walk. The findings are quite amazing. I only dropped a few here to share. 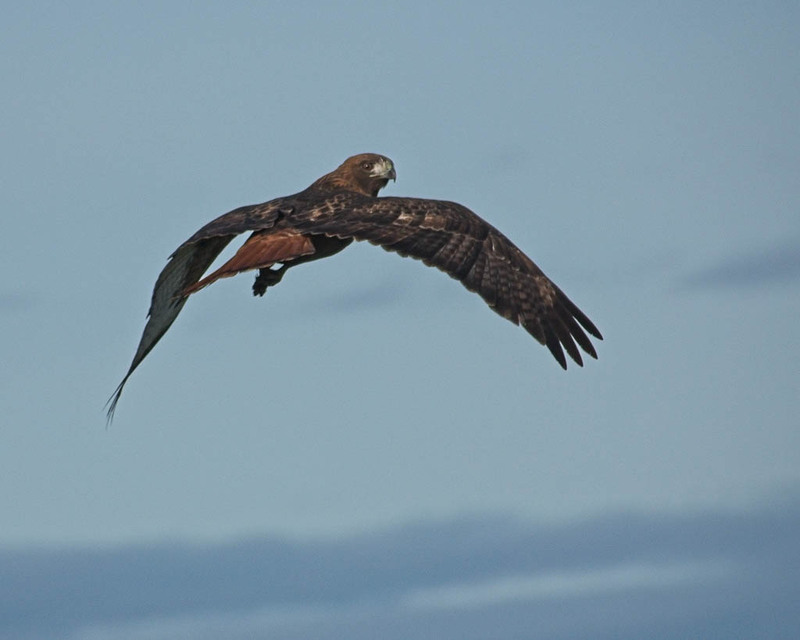 Raptors are larger birds, such as Hawk, Eagles, Falcons, Owls, and Kites etc. the so-called Birds of Prey. 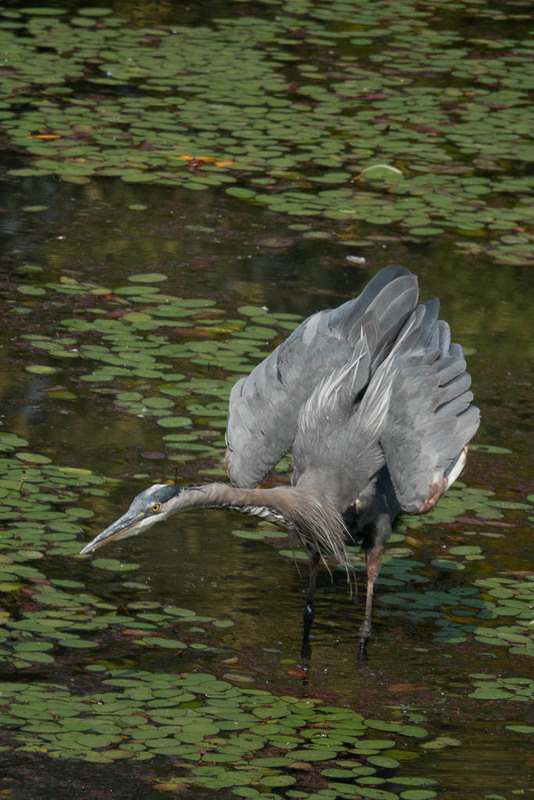 They have strong talons and beaks to hunt their prey in a flash. It’s a photographer’s joy to capture them in action. I am an incidental photographer. Every once a while, I got lucky. If not, I am content with a clear shot. American Kestrels are everywhere, but most of the time, way up there on the electric wires. 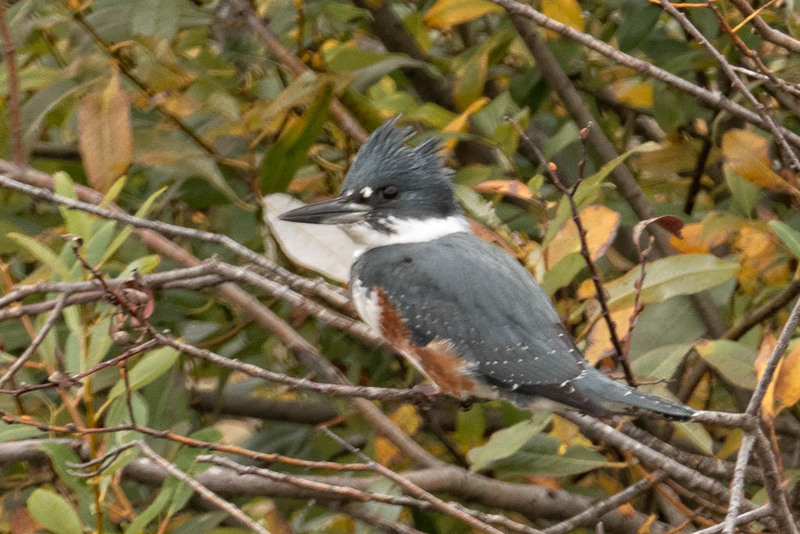 This guy was not too far from me and the light is good, but he was just not looking in my direction. Out of desperation, I yelled and made all sorts of noise. Finally, he turned his head. 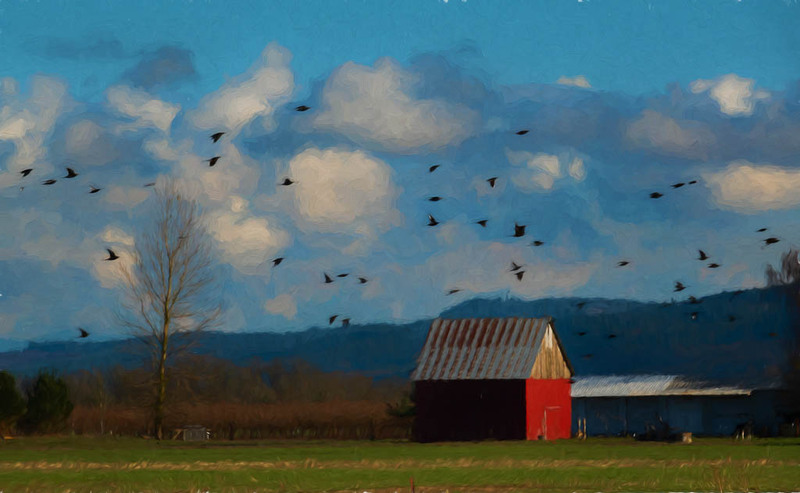 Usually, I either saw hawks hovering in the sky or perching on the fence by the road while I was driving. 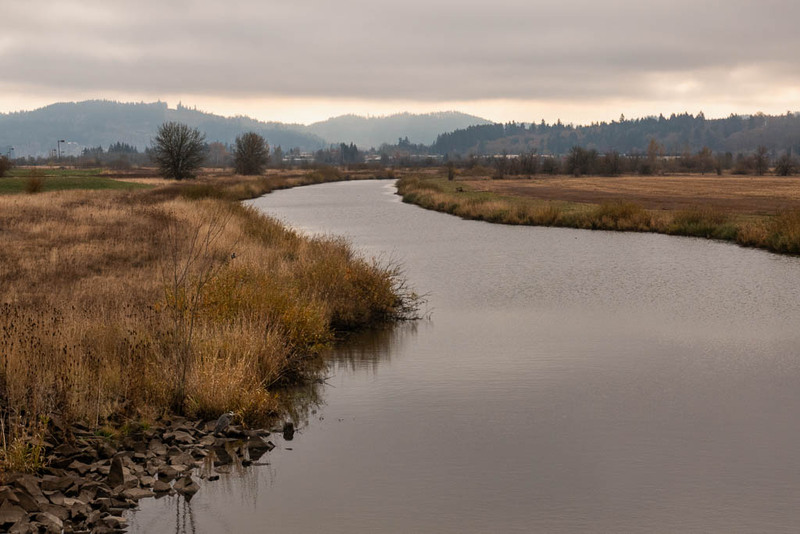 On this route recommended by my birding group, I saw at least 6 of Red-Tailed Hawks walking on the field. To most hawk shooters, this is nothing new, but it’s new to me. 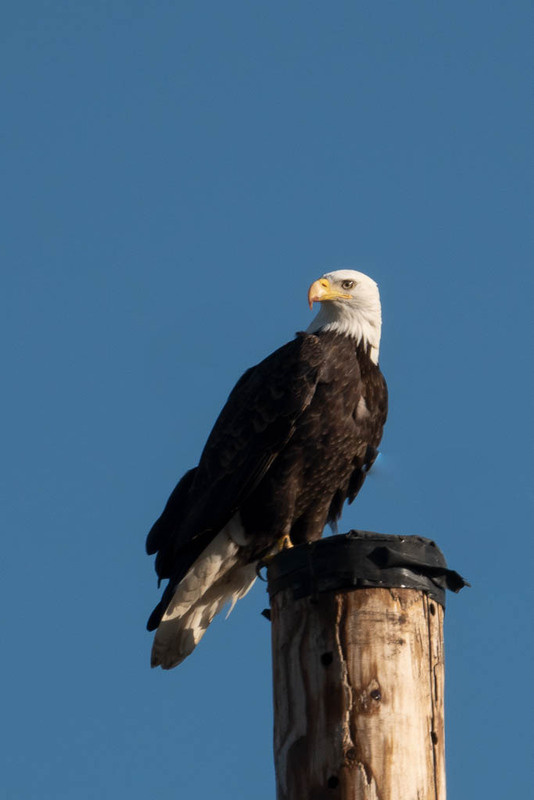 Bald Eagle is the emblem of America. They have that distinctive and majestic outlook. Raptors themselves are beautiful creatures as long as I don’t witness how they tear their preys apart and demonstrate the nature of predators. 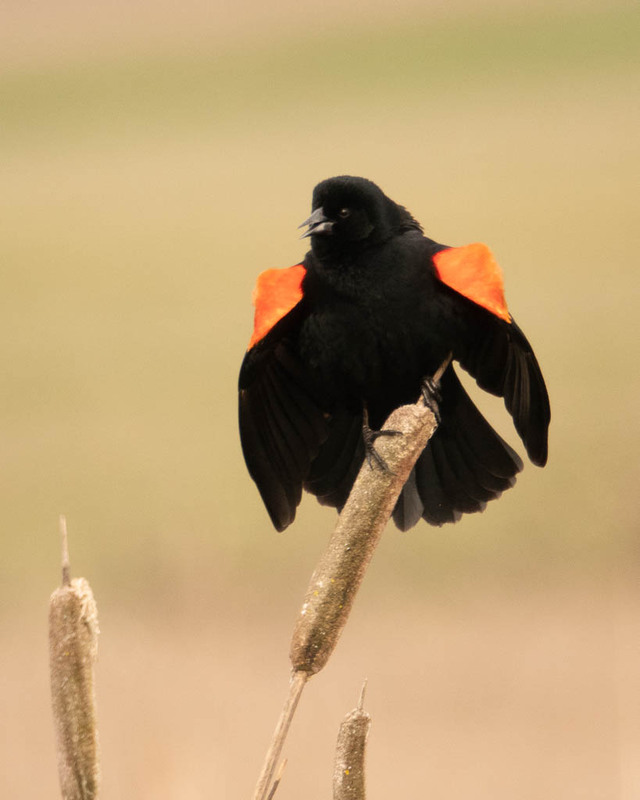 Blackbirds are nobody’s favorite, but in this instant, I appreciate their presence. Last week is probably the first time in the last five years that I skipped my weekly blog. Friends visit me from distance. I have been too busy to do much of anything besides rekindling the friendship with precious youth buddies. 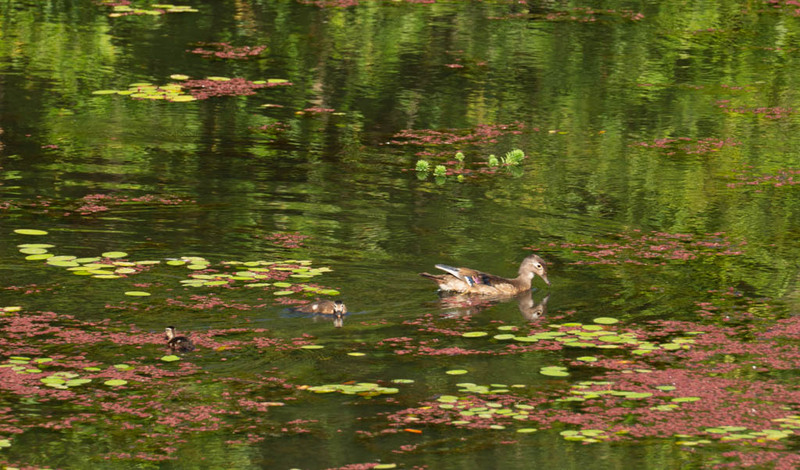 A short break strolling at local Delta Pond yesterday, I found this mama Woodduck and her babies entertaining themselves in the steaming hot day. The feeder with papaya and banana were taken over by the big birds. 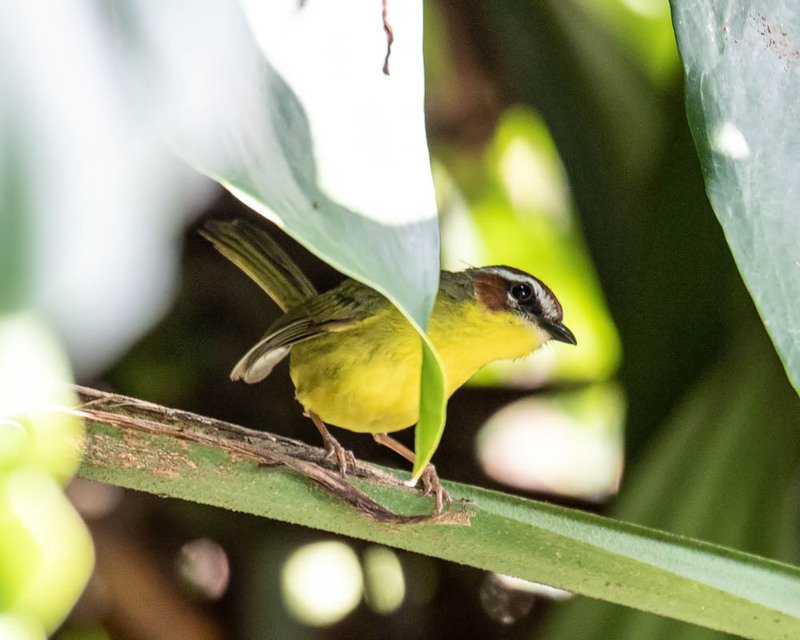 The little guy Rufus-naped Warbler was peeking and waiting patiently. 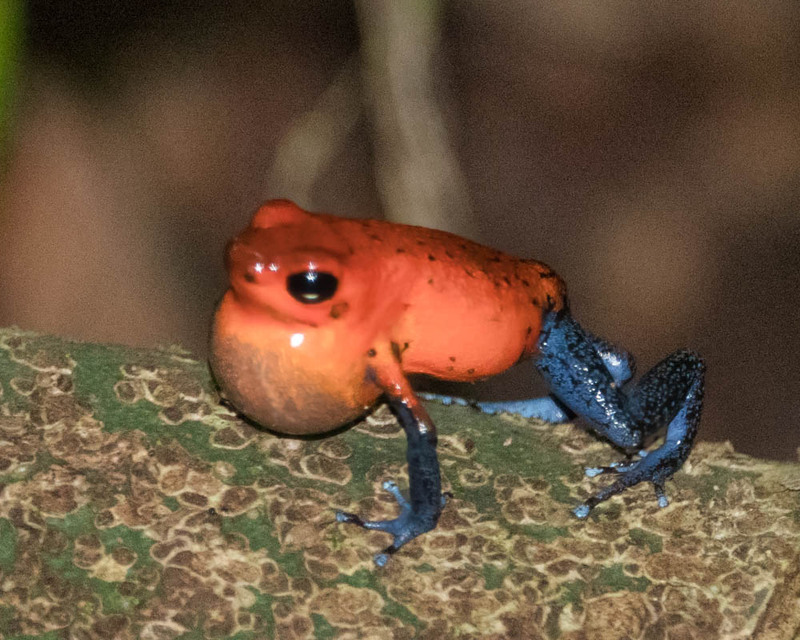 The shining skin makes it look like a porcelain Strawberry Frog. The ‘carpet’ underneath is actually a patch of dry grass with brown spots in the jungle. Pictures can be deceiving sometimes, but most of the time is for the good cause. 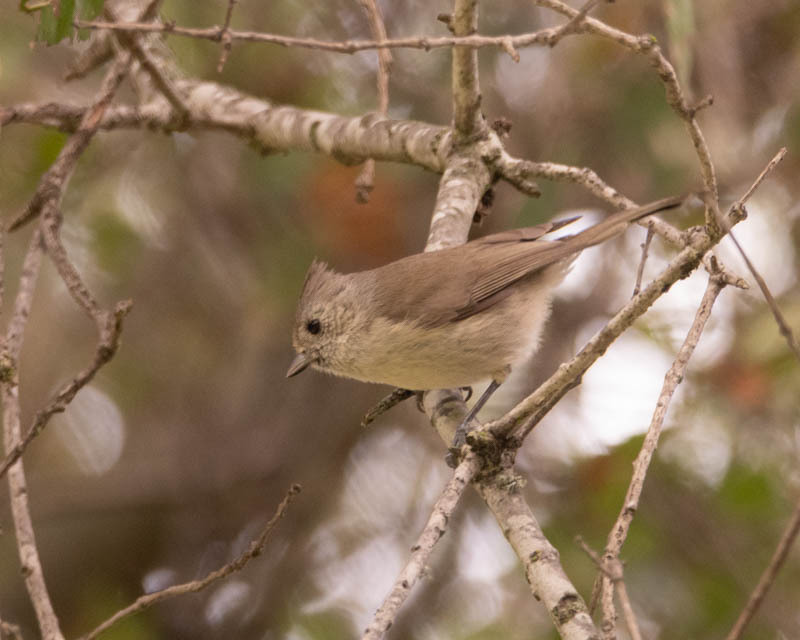 At least a dozen shots were taken for this cute Collard Redstar. He was there for a good ten minutes and jumping all over the place. 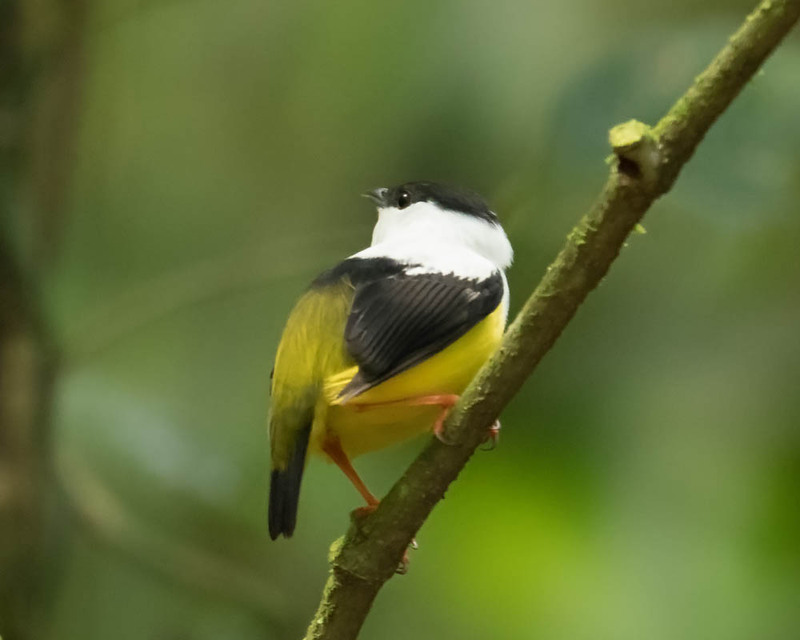 I love the shot of this White-Collard Manakin . Wish he was closer and I don’t have to remove so much noise. The image gets a bit soft after noise reduction. 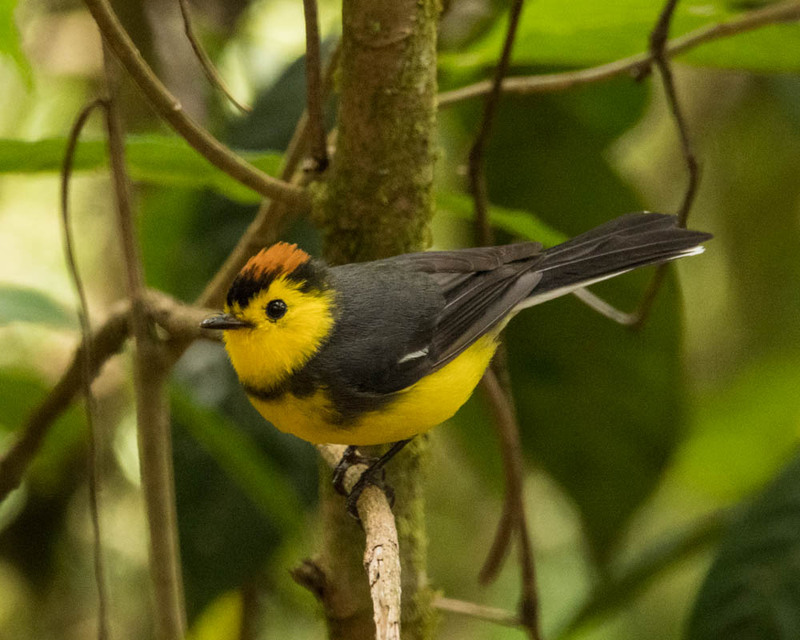 Besides Motmot, Manakin is my another favorite.